Aside from confusing the demand and the supply side, it seems several other parts are wrong. First off, how can you “re-sell” something that they didn’t sell you in the first place? Even granting that, it’s totally for resale. For instance, I bet that woman carting a box of textbooks down our hallway last week would have probably given you $30+ for it. 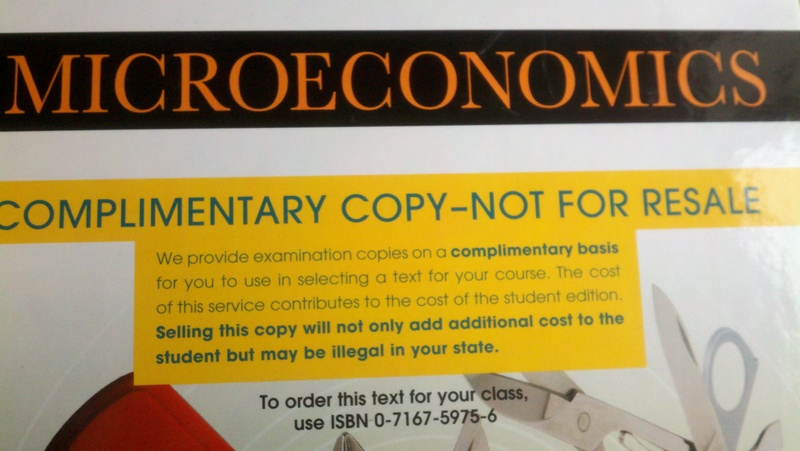 There is another undergrad micro textbook that provides incentives for sending them back – they will donate $1 to charity for every book returned. The ISBN pretty much gives the authors away! Goolsbee, Levitt, Syverson. Surely Levitt would explain it, but even economists must sell their souls to the publishers. but I thought people understood supply and demand. Otherwise what are we doing?